Autofac.Wcf 4.0.0: Doesn’t require Autofac 4.0 but is tested to be compatible with it. .NET 4.0 framework support is removed; minimum is now .NET 4.5. No interface changes were made - the major semver increment is for the .NET compatibility break. AllowPartiallyTrustedCallers and other pre-4.5 security markings are also removed. Autofac.Mef 4.0.0: Doesn’t require Autofac 4.0 but is tested to be compatible with it. .NET 4.0 framework support is removed; minimum is now .NET 4.5. No interface changes were made - the major semver increment is for the .NET compatibility break. AllowPartiallyTrustedCallers and other pre-4.5 security markings are also removed. Autofac.Extras.AttributeMetadata 4.0.0: This is a rename from Autofac.Extras.Attributed to Autofac.Extras.AttributeMetadata to express what it actually attributes. Doesn’t require Autofac 4.0 but is tested to be compatible with it. Requires Autofac.Mef 4.0 due to the security attribute changes and minimum .NET 4.5 requirement. Autofac.Multitenant.Wcf 4.0.0-beta7-223: The WCF component compatible with Autofac.Multitenant 4.0 beta. This will stay in beta until Autofac.Multitenant can also be fully released. This is a rename from Autofac.Extras.Multitenant.Wcf to match the rename of Autofac.Extras.Multitenant to Autofac.Multitenant. Requires Autofac.Wcf 4.0 due to the security attribute changes and minimum .NET 4.5 requirement. There’s a lot going on to try and keep up with DNX compatibility (where possible) and checking/testing existing integration packages to ensure they still work with Autofac 4. For the most part, it seems just updating things to use .NET 4.5 instead of .NET 4.0 allows us to retain forward-compatibility, though in some cases the code access security changes require changes. We’re working hard on it. Watch our Twitter feed for announcements! I just pushed Autofac.Multitenant 4.0.0-beta8-216 to NuGet. The multitenant support has been updated to support the same set of portable platforms that core Autofac supports (dnx451, dotnet, net45, netcore45). This builds on top of DNX beta 8. If you’re using DNX and want to try out multitenancy, give this a shot. If you find any issues, please let us know at the Autofac.Multitenant repo! I normally don’t sew too much outside of Halloween, when it becomes more an excuse to set aside time to make cool stuff than anything else. 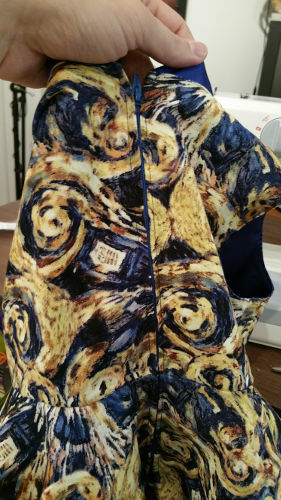 However, I saw this “Exploding TARDIS” fabric at Jo-Ann the other day and had to make something out of it. 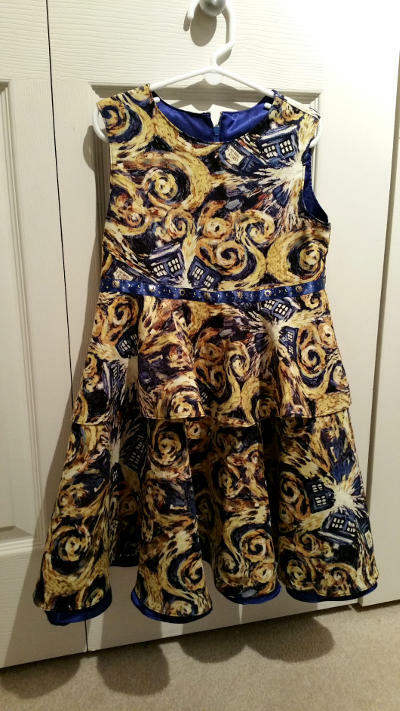 Since my daughter Phoenix is a Whovian like myself, I figured I’d make her a little dress. I went with Butterick “See & Sew” pattern B5443 because it was a whopping $3 and it was a fairly simple thing. I also got some shiny blue lining to go in it. The most time consuming part was, as usual, pinning and cutting all the pieces. I did a bit of a modification and let the blue lining hang slightly below the body of the dress for a peek of that shiny blue. 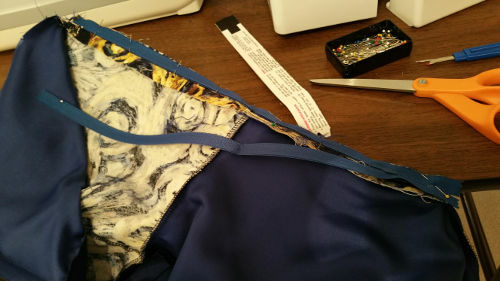 I also finished the waist with a ribbon that has gold sun, moon, and stars printed on it. 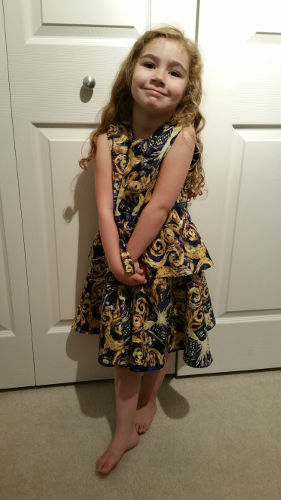 And here is the proud four-year-old Whovian in her new exploding TARDIS dress. All told it took about a day and a half from start to finish. I really started around 10 or 11 on Saturday, ran it through until around 10 Saturday night, and finished up in a couple of hours on Sunday morning. Not too bad. This was the first thing I’ve made since I got Jenn a Brother 1034D serger for Christmas, and let me tell you - the serger makes all the difference. The seams come out very professional looking and the garment has a much more “store bought” quality to it. 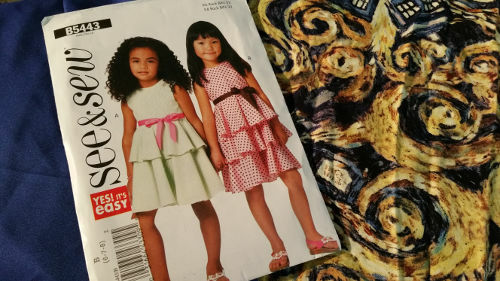 I bought enough of the fabric to make myself a shirt using Vogue pattern 8800. 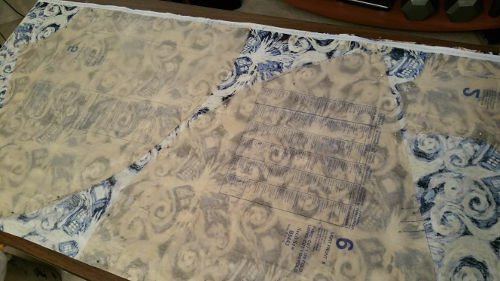 I’ve used that pattern before and it comes out well, if a bit snug, so this next go-round with it I’ll make one size larger for some breathing room. In November of last year I set up a PPTP VPN on my Synology NAS so I could do more secure browsing on public wifi. Since then, I’ve updated my setup to use OpenVPN and made the connection a lot easier. I based the steps to get my connection working on this forum post but I didn’t do quite the extra work with the certificates. Open the VPN Server application in the Diskstation Manager. Enable the OpenVPN protocol by checking the box. Leave everything else as default. At the bottom of the OpenVPN panel, click “Export Configuration.” This will give you the profile you’ll need for your devices to connect to the VPN. In the Control Panel, go to the “Security” tab. On the “certificate” panel, click “Export Certificate.” Save that somewhere and call it ca.crt. This is a little different than what I was expecting - I had hoped the certificates that come in the OpenVPN zip file (when you export that configuration) would just work, but it turns out I needed to get this particular certificate. YMMV on this. Just like with the PPTP VPN, make sure the firewall has a rule to allow port 1194 (the OpenVPN port) through. You also need to create a port forwarding rule for port 1194 with your router. You can see how to do this in my other article. You should have OpenVPN up and running. That part, at least for me, was the easiest part. The harder part was getting my Android phone connected to it and trying to automate that. First things first, let’s get connected. Install the OpenVPN Connect app for Android. There are several OpenVPN apps out there; I use this one and the rest of my article will assume you do, too. The app is free, so there’s no risk if you don’t like it. The remote line at the top points to your public DNS entry for your Synology, like yourdiskstation.synology.me or whatever you set up. The ca line has ca.crt in it. Here’s what it should generally look like. I’ve left the comments in that are there by default. # not only the address which was specified in the --remote option. # such as a dial-in user or DHCP client. # dhcp-option DNS: To set primary domain name server address. # Repeat this option to set secondary DNS server addresses. Put the ca.crt certificate you exported and the openvpn.ovpn file on your Android device. Make sure it’s somewhere you can find later. Open the OpenVPN Connect app and select “Import Profile.” Select the openvpn.ovpn file you pushed over. Magic should happen and you will see your VPN show up in the app. Now’s a good time to test the connection to your VPN. 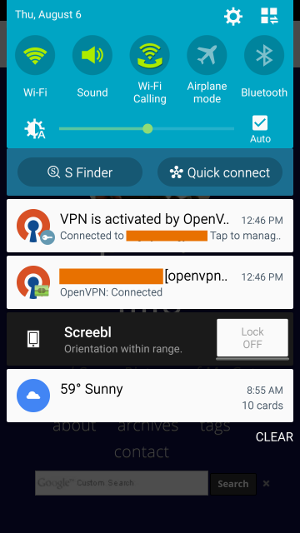 Enter your username and password into the OpenVPN Connect app, check the Save button to save your credentials, and click the “Connect” button. It should find your VPN and connect. When you connect you may see a little “warning” icon saying network communication could be monitored by a third-party - that’s Android seeing your Synology’s certificate. You should also see OpenVPN Connect telling you you’re connected. It’s important to save your credentials in OpenVPN Connect or the automation of connecting to the VPN later will fail. Did you enter your username/password correctly using an account defined on the Synology? Did the router port forwarding get set up? Did the firewall rule get set up? Is your dynamic DNS entry working? Is the ca.crt in the same folder on your Android device as the openvpn.ovpn file? Consider trying the instructions in this forum post to embed the certificate info right in the openvpn.ovpn file. From here on out, I assume you can connect to your VPN. Now we want to make it so you connect automatically to the VPN when you’re on a wifi network that isn’t your own. I even VPN in when I’m on a “secure” network like at a hotel where you need a password because, well, there are a lot of people on there with you and do you trust them all? I didn’t think so. Install the Tasker app for Android. This one will cost you $3 but it’s $3 well spent. Tasker helps you automate things on your Android phone and you don’t even need root access. I found the instructions for setting up Tasker with OpenVPN Connect over on the OpenVPN forums via a reddit thread. I’ll put them here for completeness, but total credit to the folks who originally figured this out. UPDATE 2/19/2018: OpenVPN Connect 3.0 has a different set of intents used for Tasker automation. I’ll update the instructions for Tasker below to show both ways, but pick the right one for your Android app version. We’re going to set up a task to connect to the VPN when you’re on a network not your own and then disconnect from the VPN when you leave the network. Call the task Connect To Home VPN. Use System -> Send Intent as the action. Create a second new task in Tasker. Call the task Disconnect From Home VPN. Create a new profile in Tasker and add a context. Use State -> Net -> Wifi Connected as the context. In the SSID field put the SSID of your home/trusted network. If you have more than one, separate with slashes like network1/network2. Check the Invert box. You want the context to run when you’re not connected to these networks. When asked for a task to associate with the profile, select Connect To Home VPN. On the home screen of Tasker you should see the name of the profile you created and, just under that, a “context” showing something like Not Wifi Connected network1/network2. Long-press on the context and it’ll pop up a menu allowing you to add another context. Leave all the other fields blank and do not check the Invert box. On the home screen of Tasker you should now see the profile has two contexts - one for Not Wifi Connected network1/network2 and one for Wifi Connected *,*,*. This profile will match when you’re on a wifi network that isn’t in your “whitelist” of trusted networks. Next to the contexts you should see a little green arrow pointing to Connect To Home VPN - this means when you’re on a wifi network not in your “whitelist” the VPN connection will run. Long-press on the Connect To Home VPN task next to those contexts. You’ll be allowed to add an “Exit Task.” Do that. Select the Disconnect From Home VPN task you created as the exit task. Now when you disconnect from the untrusted wifi network, you’ll also disconnect from the VPN. You can test the Tasker tasks out by going to the “Tasks” page in Tasker and running each individually. Running the Connect To Home VPN task should quickly run OpenVPN Connect, log you in, and be done. Disconnect From Home VPN should log you out. Did you save your credentials in the OpenVPN Connect app? Do you have a typo in any of the task fields? Did you copy your OpenVPN Connnect profile name correctly? You should now have an Android device that automatically connects to your Synology-hosted OpenVPN whenever you’re on someone else’s network. The cool thing about OpenVPN that I didn’t see with PPTP is that I don’t have to set up a proxy with it. I got some comments on my previous article where some folks were lucky enough to not need to set up a proxy. I somehow needed it with PPTP but don’t need it anymore with OpenVPN. Nice. NOTE: I can’t offer you individual support on this. Much as I’d like to be able to help everyone, I just don’t have time. I ask questions and follow forum threads like everyone else. If you run into trouble, Synology has a great forum where you can ask questions so I’d suggest checking that out. The above worked for me. I really hope it works for you. But it’s not fall-down easy and sometimes weird differences in network setup can make or break you.